Rocky got the car and got Shivanya in the car. Yamini sat next to him hiding her face. Sesha came to them and insisted on fighting with her. He denied saying that he never fight with women. She punched him. She then turned into naagin and threw him down. She then tied him to a tree when he became a snake. She then threw him and said that she was sparing him that time but not the next time. Shivangee was brought to the hospital. Doctor said that Shivangi could not be saved if she did not get conscious within 4 hours. Rocky said to Yamini that he loved Shivangi. Yamini thought that Shivangee might die. Shivanya went to the temple and prayed for Shivangi’s life. Shivanya said that she would do tandav to save her daughter. Shiv ji was impressed with him and was happy. A snake entered in Shivangi’s room and sucked the poison from her body. She woke up. Doctor told everyone that Shivangi was fine. Yamini said to Rocky that she would make Shivaangi marry with Rocky. Rocky went to her and happily hugged her. Yamini was told that Shivanya wanted to meet her. Yamini nervously nods yes. Yamini came to her room. Sesha came there and shouted as how she could make Rocky marry to Shivangee. Yaamini scolded her and asked her to go. Sesha then went to Shivangi’s room but did not find her. She got angry when she did not find her there and got angrier at her. Shivangi was in park waiting for Rocky. He came there and held her. He asked her as for why she called him there. She said that she was told that he was there. She hugged him. Sesha shouted that earlier Shivanya snatched Rithik from her and now her daughter was snatching Rocky from her. She would not let it happen. She then left from there. Shivangi came back to her room and found her things not in place and her photo frame broken. Shivangi called Rocky that she needed to talk to his badi maa. Yaminee was worried to meet Shivanya. She spoke to her in a different voice. Shivanya said that she wanted to meet to get marriage fixed. Shivanya happily told Shivangi that her papa would come there. Shivangi was surprised and stated that she was told that her father died 25 years ago in a car accident. She asked her as for why she lied to her. Shivanya turned. Shivangi asked her to tell her the truth. 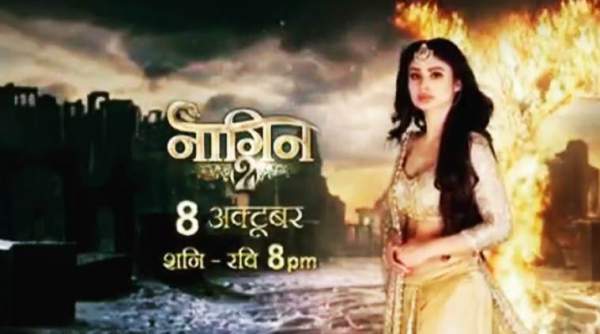 Stay tuned for latest Naagin 2 news and updates.